Yellow spores of the fungus Puccinia striiformis f.sp. tritici, which causes stripe rust disease in wheat. Photo: CIMMYT/Mike Listman. 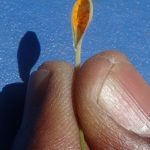 Rapidly emerging and evolving races of wheat stem rust and stripe rust disease—the crop’s deadliest scourges worldwide—drove large-scale seed replacement by Ethiopia’s farmers during 2009-14, as the genetic resistance of widely-grown wheat varieties no longer proved effective against the novel pathogen strains, according to a new study by the International Maize and Wheat Improvement Center (CIMMYT). Based on two surveys conducted by CIMMYT and the Ethiopian Institute of Agricultural Research (EIAR) and involving more than 2,000 Ethiopian wheat farmers, the study shows that farmers need access to a range of genetically diverse wheat varieties whose resistance is based on multiple genes. After a severe outbreak in 2010-11 of a previously unseen stripe rust strain, 40 percent of the affected farm households quickly replaced popular but susceptible wheat varieties, according to Moti Jaleta, agricultural economist at CIMMYT and co-author of the publication. The fourth most widely grown cereal after tef, maize, and sorghum, wheat in Ethiopia is produced largely by smallholder farmers under rainfed conditions. Wheat production and area under cultivation have increased significantly in the last decade and Ethiopia is among Africa’s top three wheat producers, but the country still imports on average 1.4 million tons of wheat per year to meet domestic demand. National and international organizations such as EIAR, CIMMYT, and the International Centre for Agricultural Research in the Dry Areas (ICARDA) are working intensely to identify and incorporate new sources of disease resistance into improved wheat varieties and to support the multiplication of more seed to meet farmer demand. 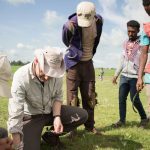 New wheat varieties have provided bigger harvests and incomes for Ethiopia farmers in the last decade, but swiftly mutating and spreading disease strains are endangering wheat’s future, according to Dave Hodson, CIMMYT expert in geographic information and decision support systems, co-author of the new study. 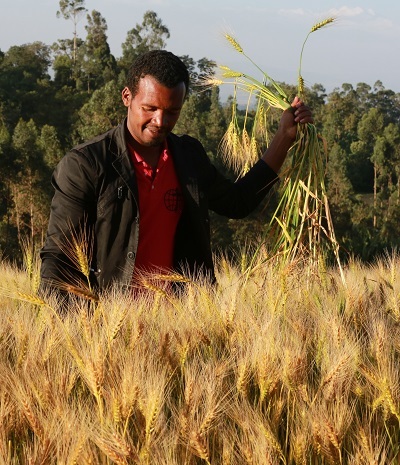 Ethiopian wheat farmers like Abebe Abora, of Doyogena, have benefitted from adopting high-yielding wheat varieties but face threats from fast mutating races of wheat rust disease pathogens. Photo: CIMMYT/Apollo Habtamu. As an example, he mentioned the case of the wheat variety Digalu, which is resistant to stripe rust and was quickly adopted by farmers after the 2010-11 epidemic. But Digalu has recently shown susceptibility to TKTTF stem rust and must now be replaced. 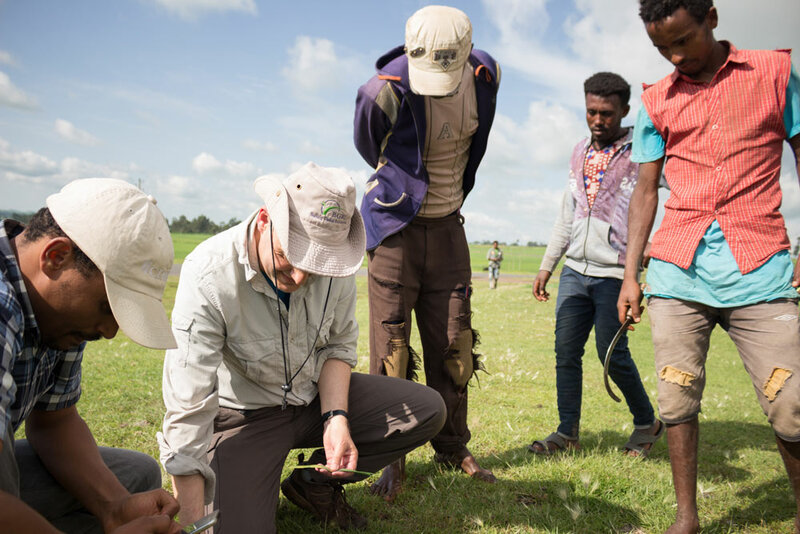 Hodson said as well that continuous monitoring of the rust populations in Ethiopia and the surrounding region is essential to detect and respond to emerging threats, as well as to ensure that the key pathogen races are used to screen for resistance in wheat breeding programs. Hodson and partners at the John Innes Centre, UK, and EIAR are leading development of a handheld tool that allows rapid identification of disease strains in the field, instead of having to send them to a laboratory and lose precious time awaiting the results. The authors would like to acknowledge the Standing Panel for Impact Assessment (SPIA) for financing, the Diffusion and Impacts of Improved Varieties in Africa (DIIVA) project that supported the first survey in 2011, and Cornell University, the Bill & Melinda Gates Foundation, and United Kingdom’s Department for International Development (DFID) through the Durable Rust Resistance in Wheat (DRRW, now called Delivering Genetic Gain in Wheat) project for support for the second survey in 2014. Scientists have shown that the first appearance of wheat stem rust disease in the U.K. in nearly 60 years, which occurred in 2013, was caused by the same virulent fungal strain responsible for recent wheat stem rust outbreaks in Ethiopia, Denmark, Germany, and Sweden. to the gods to avoid disease outbreaks on their wheat crops. As reported today in Communications Biology, an international team of researchers led by the John Innes Centre, U.K., found that 80 percent of U.K. wheat varieties are susceptible to the deadly stem rust strain. The group also confirmed for the first time in many decades that the stem rust fungus was growing on barberry bush, the pathogen’s alternate host, in the UK. “This signals the rising threat of stem rust disease for wheat and barley production in Europe,” said Dave Hodson, senior scientist at the International Maize and Wheat Improvement Center (CIMMYT) and co-author on the study. A scourge of wheat since biblical times, stem rust caused major losses to North American wheat crops in the early 20th century. Stem rust disease was controlled for decades through the use of resistant wheat varieties bred in the 1950s by scientist Norman Borlaug and his colleagues. Widespread adoption of those varieties sparked the Green Revolution of the 1960s and 70s. 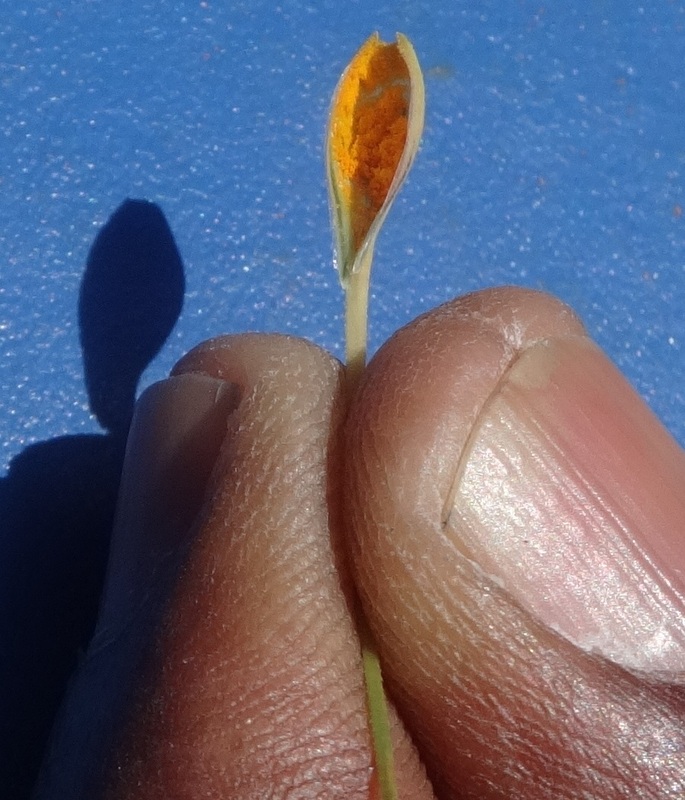 In 1999 a new, highly-virulent strain of the stem rust fungus emerged in eastern Africa. Spores of that strain and variants have spread rapidly and are threatening or overcoming the genetic resistance of many currently sown wheat varieties. Scientists worldwide joined forces in the early 2000s to develop new, resistant varieties and to monitor and control outbreaks of stem rust and yellow rust, as part of collaborations such as the Borlaug Global Rust Initiative led by Cornell University. the temperate and subtropical regions. 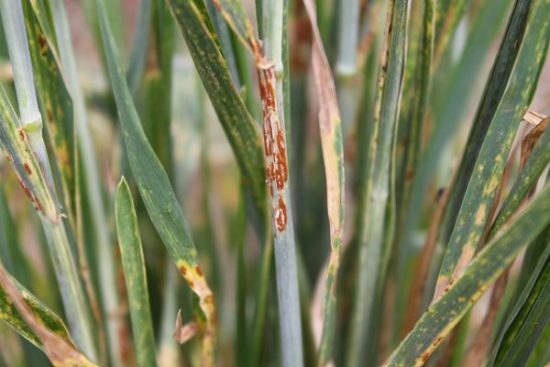 The Communications Biology study shows that 2013 U.K. stem rust strain is related to TKTTF, a fungal race first detected in Turkey that spread across the Middle East and recently into Europe. It was the dominant race in the 2013 stem rust outbreak in Germany and infected 10,000 hectares of wheat in Ethiopia’s breadbasket the same year. Because disease organisms mutate quickly to overcome crop resistance controlled by single genes, researchers are rushing to identify new resistance genes and to incorporate multiple genes into high-yielding varieties, according to Ravi Singh, CIMMYT wheat scientist who participated in the reported study. “The greatest hope for achieving durable resistance to rust diseases is to make wheat’s resistance genetically complex, combining several genes and resistance mechanisms,” Singh explained. 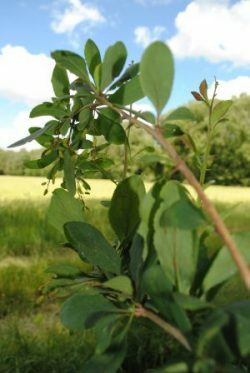 Barberry, which serves as a spawning ground for the stem rust fungus, was largely eradicated from the U.K. and U.S. last century, greatly reducing the spread and genetic diversification of rust disease races. Now barberry is being grown again in the U.K. over the last decade, according to Diane G.O. Saunders, John Innes Centre scientist and co-author of the study. Click here to read the John Innes Centre media release about the Communications Biology report and view the report.